Bel. joins Just. personal guards before Just. is emperor, rises with Just. The further we go into the last 3 volumes, the more, well, ahem! drama-filled, and perhaps hormone-racing the footnotes become. Here are a select few from the last 10 pages of Gibbon. All things naval is the proper province of any English Gentleman of the 18th century Empire, and Gibbon is no exception. Here he questions the already suspect speechifying of John of Cappadocia (who is trying to show how DIFFICULT a war in NORTH AFRICA would be to an empire centered on Constantinople way in the North. That’s all well and good, but Gibbon falls all over himself in exclaiming how idiotic his arguments are for a Mediterranean voyage and a small, Mediterranean empire – nothing like a global empire beginning to encompass the entire subcontinent of India! A little late-eighteenth century smirking ensues. A year – absurd exaggeration! The conquest of Africa may be dated A.D. 533, September 14. 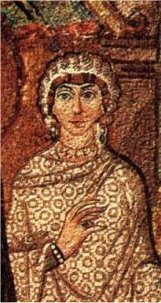 It is celebrated by Justinian in the preface to his Institutes, which were published November 21 of the same year. Including the voyage and return, such a computation might be truly applied to our Indian empire. 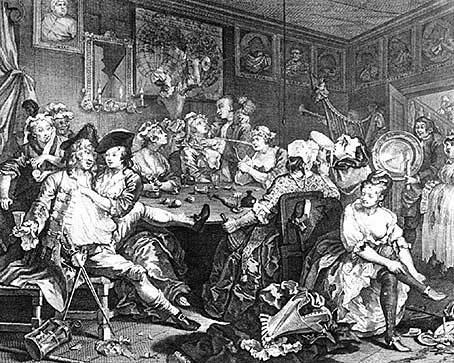 Before Mothers Against Drunk Driving (MADD) and stricter and stricter Driving Under the Influence (DUI) laws it was pretty incomprehensible for the average hard-drinking English Gentleman to imagine why a law would be more stringent and punishment more severe if alcohol were involved – although apparently the Ancient Greeks had come to the same conclusion as we have in the last few decades in the Western world. Oh, those Ancient Greeks! Throwing the book at drunks! What strange, ancient, quaint legal behavior! I have read of a Greek legislator, who inflicted a double penalty on the crimes committed in a state of intoxication; but it seems agreed that this was rather a political than a moral law. Gibbon, as a citizen of a naval-based empire, knows (or would like to be known as) a man who knows his ship – he’s practically apoplectic when confronted with historians who not only don’t know anything about ships, but have little ability to add. The smallest of these vessels may be computed at thirty, the largest at five hundred, tons; and the fair average will supply an allowance, liberal, but not profuse, of about one hundred thousand tons, (10) for the reception of thirty-five thousand soldiers and sailors, of five thousand horses, of arms, engines, and military stores, and of a sufficient stock of water and provisions for a voyage, perhaps, of three months. The text appears to allow for the largest vessels 50,000 medimni, or 3000 tons, (since the medimnus weighed 160 Roman, or 120 avoirdupois, pounds.) I have given a more rational interpretation, by supposing that the Attic style of Procopius conceals the legal and popular modius, a sixth part of the medimnus, (Hooper’s Ancient Measures, p. 152, &c.) A contrary and indeed a stranger mistake has crept into an oration of Dinarchus, (contra Demosthenem, in Reiske Orator. Graec tom iv. P. ii. p. 34.) By reducing the number of ships from 500 to 50, and translating by mines, or pounds, Cousin has generously allowed 500 tons for the whole of the Imperial fleet! Did he never think? The Dromon (Greek for runner) was probably the kind of ship used to transport the troops and supplies to and from Africa – although, in all actuality, the Roman government probably commandeered most of the commercial shipping fleet of the Eastern Mediterranean to mount the invasion of Vandal North Africa and Sicily, so it was probably a pretty motley, variegated, and non-uniform “fleet” that set sail in the bright June sunshine in 533. 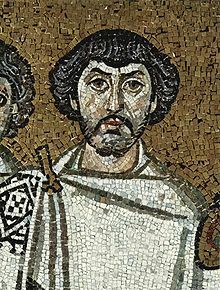 A Possible Life-Portrait of Belisarius - from the mosaics in the church of San Vitale Ravenna - this is the anonymous man standing immediately to the right of Justinian - is this the face of Belisarius? According to a story that gained popularity during the Middle Ages, Justinian is said to have ordered Belisarius’ eyes to be put out, and reduced him to the status of homeless beggar near the Pincian Gate of Rome, condemned to asking passers-by to “give an obolus to Belisarius” (date obolum Belisario), before pardoning him. Most modern scholars believe the story to be apocryphal, though Philip Stanhope, a 19th century British philologist who wrote Life of Belisarius — the only exhaustive biography of the great general — believed the story to be true. Based on a parsing of the available primary sources, Stanhope created an argument for the legend’s authenticity. Though the legend remains of dubious provenance, after the publication of Jean-François Marmontel’s novel Bélisaire (1767), this account became a popular subject for progressive painters and their patrons in the later 18th century, who saw parallels between the actions of Justinian and the repression imposed by contemporary rulers. For such subtexts, Marmontel’s novel received a public censure by Louis Legrand of the Sorbonne, which contemporary divines regarded as model expositions of theological knowledge and clear thinking (Catholic Encyclopedia: “Louis Legrand”). Marmontel and the painters and sculptors (a bust of Belisarius by the French sculptor Jean-Baptiste Stouf is at the J. Paul Getty Museum) depicted Belisarius as a kind of secular saint, sharing the suffering of the downtrodden poor. The most famous of these paintings, by Jacques-Louis David, combines the themes of charity (the alms giver), injustice (Belisarius), and the radical reversal of power (the soldier who recognises his old commander). Others portray him being helped by the poor after his rejection by the powerful.